I’ve been working for an amazing charity for the last few months and am incredibly proud of what I’m doing and the inspirational people I’m meeting along the way. Disability Awareness UK (www.disabilityawarenessuk.org) train and support volunteers with disabilities to go into schools and talk about their experiences. They don’t charge schools for this service, relying on donations instead. They employ disabled people and have volunteers with disabilities running the charity. My role, as an outreach worker, involves recruiting people to speak in schools so I have been contacting disability groups and charities in order to reach disabled people. This week I interviewed an inspirational young lady who was excited and motivated by the prospect of getting something positive out of all the negative health issues she’s suffered in her young life. She was diagnosed with kidney cancer when she was 12 and the aggressive chemotherapy that cured the cancer has left her with numerous problems and an invisible disability. Nerve pain makes walking long distances very difficult and she can’t stand up for long periods of time without feeling crippled with pain. We talked at length about how hard every day situations can be for her as it’s not obvious to other people that she has a disability. She was sat down on the bus recently and people were tutting behind her and making comments about “young people” today not giving up their seats for older people. I never have this problem as my sticks are a beacon to other people, sending out a very clear message that I have a disability and exactly what it is. People fall over themselves to help me and I’m reminded constantly how nice most people are and how much they want to help. She said she’d like a hat or a t-shirt with the word “disabled” emblazoned on it so people get the message but a stick would do the job just as well. I also gave a talk yesterday at a day center and met some fabulous people who were interested in talking to children and raising awareness. One man, who is a wheel chair user following a stroke, was particularly keen. He told me how he used to train people in health and safety before his stroke so has so many skills that could be transferred to this kind of voluntary work. Other people in the group talked about their experiences and the ignorance and prejudice they encounter. One man said some children didn’t want to to go near him recently in a shop in case they “caught” his disabilities. He’d had a car accident that left him unable to walk. Sounds like a fantastic project! 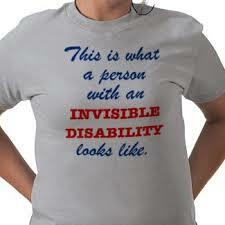 I’m going to include this post in my list of resources on my new website on invisible MS, when it launches. I did classroom presentations on depression here in Canada years ago, and I really think this kind of initiative makes a difference in raising awareness. Way to go, Abigail! Hey, thanks! It is a great charity that runs on a shoe string!